Bulls eye, I did it. As part of the 3.9 percent of people who picked Auburn to reach the Final Four, I humbly accept the credibility I deserve. That is, as long as you overlook how wrong the rest of my Final Four predictions are. Somehow, Auburn was the only team in this Final Four that I predicted right. But that is because this year’s Elite Eight matches were some of the hardest to predict. I am the only Sciencing writer to have one correct Final Four team. First, No. 2 Tennessee was knocked out in the Sweet Sixteen by No. 3 Purdue. No. 3 seeds only have a 37 percent win rate in this matchup. Then, No. 1 Gonzaga got stunned in a 75-69 Elite Eight loss to No. 3 Texas Tech. No. 3 seeds have just a 39 percent win rate in this matchup. And finally, after multiple close calls earlier in the tournament, No. 1 Duke was defeated by No. 2 Michigan State, 68-67. While a No. 1 versus a No. 2 has historically been a 50-50 matchup in the Elite Eight, the power of Zion Williamson propelled Duke to be the favorites in this instance. So many No. 1 and No. 2 seeds eliminated, but No. 5 Auburn is still dancing. The Tigers carved up high-ranking teams to reach their first Final Four in program history. And all that after narrowly escaping being upset by No. 12 New Mexico State in the first round. Auburn is a fun team to watch. They play fast, get lots of players involved and shoot plenty of three-pointers. The Tigers have 10 players averaging double-digit minutes and lead the nation in three-point scoring. The Tigers do not sit back on defense either, forcing turnovers on almost 25 percent of opponents' possessions, which leads all of NCAA DI. But after five NCAA Tournament wins, Auburn’s most impressive trait is their adaptability. One of Sciencing’s ambitious predictions for bracket-making was, “At least one team with a higher seed than No. 5 will make it to the Final Four.” With this recommendation in mind, I picked No. 5 Auburn to make a deep run. Auburn has been tearing it up since their last loss, when they were picked apart by Kentucky, 80-53 on Feb. 23. The Tigers were held to 32.8 percent shooting from the field. They were out rebounded 24-43. But that loss now seems instrumental for Auburn’s historic run. It was the turning point for the Tigers. Since that loss, Auburn has not been out-rebounded by that margin or held to that low of a field goal percentage. The Tigers closed out the rest of the season by tearing up the SEC, a conference with seven representatives in this year’s tournament. When entering the NCAA Tournament, the team was riding an eight game winning streak, including four wins in the SEC Championship tournament. The Tigers earned their spot in this year’s big dance by dominating No. 2 Tennessee, 84-64. In the Sweet Sixteen, Auburn took down No. 1 North Carolina, a matchup that No. 5 seeds only win at a 17 percent rate. The Tigers put together a dominant second half for the 97-80 win, making 17 three-pointers in the process. While the storm of shots from beyond the arc was expected, it seemed the flood gates had been opened. While the Tigers average 11.4 three-pointers per game, they drained a whopping 12 three’s in the second half alone. However, the joy of victory was tempered by loss. Sophomore forward Chuma Okeke, who was Auburn’s best player that game with 20 points and 11 rebounds, suffered a season-ending knee injury midway through the second half. Auburn then faced Kentucky, the last team to serve the Tigers a defeat. While a No. 5 beating a No. 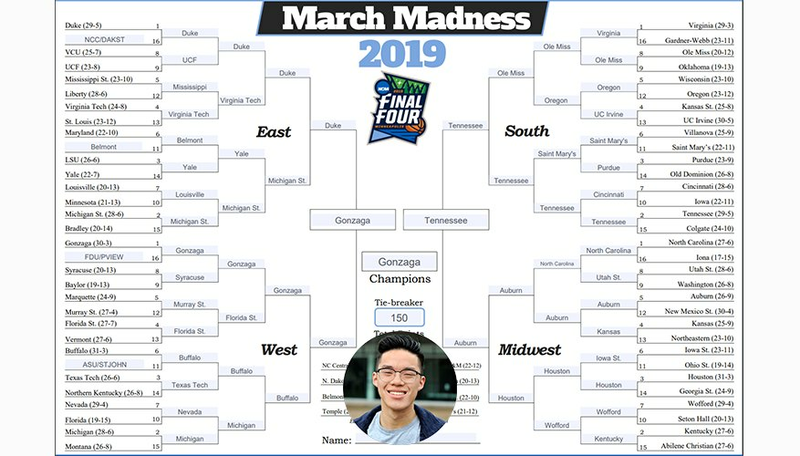 2 seed is not an upset by Sciencing’s standard, Kentucky were definitely the favored team in this matchup. Auburn had lost both regular season meetings against Kentucky, who rank seventh on AP’s Top 25 Poll. However, the No. 5 seed has won the matchup against a No. 2 seed all three times that it has occured in the Elite Eight. The stats did not lie here, as Auburn won 77-71 in overtime. Without Okeke, the team’s third leading point-scorer, Auburn needed to adjust. But as Okeke watched the game from the hotel, caring for his injury, the Tigers struggled. After Auburn faced a 30-35 deficit at halftime, trailing by as much as 11 points throughout the first half, Okeke decided to be with his team in the arena. As Okeke sat on the sidelines in a wheelchair, The Tigers’ seemed inspired. They rallied to come back, force overtime and take the win. Despite having lost a key player, Auburn showed adaptability. The team only made seven of its offenses’ signature three-pointers, instead scoring almost half its points from inside the paint. There was less scoring by committee as well. Junior guard Jared Harper and senior guard Bryce Brown combined for 50 points. The 5-foot-11-inch Harper was the most exciting player on the floor, recording 26 points, four rebounds, five assists, three steals and two blocks. His playmaking ability lead him to score 12 points in overtime, six points from the field and six points from free throws. Auburn basketball is not usually a two-man show. The Tigers’ bench outscored UNC’s 40-21 while six players reached double digit point totals in the Sweet Sixteen matchup. The Elite Eight game was just different, with Harper showing his creativity and Brown going 8 for 12 from the field and adding four three-pointers. Whether it's Bruce Pearl’s crafty coaching or Okeke’s inspiration on and off the court, Auburn has put together an amazing run. They have already defeated No. 4 Kansas, No.1 North Carolina and No. 2 Kentucky. But the Tigers have another giant to face. Auburn will face the tournament’s second overall seed, AP’s second best team in the nation, and this year’s only remaining No. 1 seed: Virginia. This will be the Tigers’ toughest challenge yet, but since Auburn is a team that seems so adaptable, it is hard to count them out. We, and possibly even Virginia, do not know which style Auburn will bring on Saturday. But I am here for it. Truong, Brian. "A Love Letter to Auburn, My Darling Final Four Pick." Sciencing, https://sciencing.com/a-love-letter-to-auburn-my-darling-final-four-pick-13718186.html. 02 April 2019.